William 'Torchy' Peden was the cycling coach for team of Canadians at the LA Olympics. Amazingly, the team from the Dominion of Canada had done well against the European cycling powerhouses. Like Torchy Peden and Louis Elder before him, Lew Rush quickly made the move to ranks of professional six day racing. At that time Lew was twenty years old. Over the next three months, October to December 1932, Lew worked further on his racing skills to become a professional six-day bike racer competing in four more six-day races in Toronto, Montreal, Minneapolis and Milwaukee. In 1933, Lew raced in 6 more six day races with his best placing being 4th place in Detroit, partnered with Godfrey "Polly" Parrott (Usa). The year 1934 was a sentinel year for North American Six-Day Racing scene with a total of 25 six-day races being held across the continent, twenty (20) 6-day races in the USA and five (5) 6-day races in Canada. It was as well a momentous year for Lew Rush, as he won his first six-day bicycle race partnered with another 1932 Olympian, Eddie Testa (Usa), at the LA 6-day race in June. "The strange accident occurred while twenty-five bicycle riders travelling at a rapid pace were going about the track in two lanes. Between the two lanes and travelling in the opposite direction, Dave Landry drove his motorcycle with the cameraman mounted on a back platform with his camera. The purpose of this arrangement was to obtain a close-up view of the bike riders in action. On the second lap about the course the front wheel of the bicycle ridden by Lew Rush collapsed, throwing the rider under the speeding wheels of the motorcycle. Elmer W. Dwyer, the cameraman, was catapulted into the air, his hurling body throwing several of the bicycle riders off balance. In the general collision that followed 16 bicycles and their riders tangled about the roaring motorcycle that squirmed and twisted about the wooden speedway. Lou Rush, 22, champion bicycle racer and former partner of Louie Testa, one-time national champion was taken to hospital with a possible skull fracture, and painful cuts and bruises on the face. Dave Landry the motorcycle driver suffered a basal skull fracture, a broken collarbone, and internal injuries, according to Police Surgeon William R. Molony of the Hollywood Receiving Hospital, little hope was held out for his recovery." (Newspaper clippings from the Freddie Schultz collection courtesy of Marilyn Schultz). Lew Rush had more than 30 stitches in his face alone and was slow to recover from these horrific injures, but after much rehabilitation and training Lew did return to the wooden saucer. In the spring of 1935 Lew Rush came back with a vengeance. It was a major comeback as over a 12 week period between March and early June 1935 Lew raced in 6 six-day races: San Francisco, Los Angeles, Pittsburgh, Toronto, San Francisco again and then Oakland. 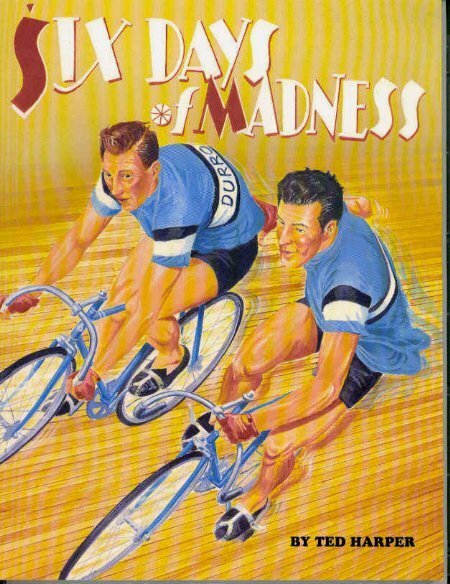 "Sportsdom's maddest, fastest, most sustained and hysterical hour will occur between 11 0'clock and midnight tonight when Oakland's first international six-day bicycle race rolls toward its finale. The description is not of our own making. It is conceded by followers of affairs athletic no one hour in sports contains more of a dynamic, fierce endeavour than the last 60 minutes of the tourney of cycling when every team remaining in the field rides forth to pick off those coveted laps which means higher money. There are no rests no breathing spells in that zero hour. Only the fittest will have survived the preceding hours. Weaklings can have no place in that final roll call. If the pace earlier in the evening is blistering, it will be searing when the goal is actually in sight and the boys have been conserving a final bit of strength for the dash lean forward over handlebars and supply the pressure (June 11, 1935).....That final hour saw Audy spilled suddenly and Echeverria and Rush put on a great sprint that could of carried them into the lead if the final pistol shot hadn't sounded at an inopportune moment. It was Rush who opened the almost successful jam and Bobby was right there to pick up him, and those two strong legged, stout hearted lads were sailing around the track steadily gaining their objective when the gun cracked. Oakland is sold on six-day bicycle racing. Followers of the pine board gondoliers, who rolled up an attendance total of 30,000 for the week, hinted at their preference early last week, affirmed their decision in the succeeding days, and hysterically emphasized it at the Auditorium Saturday night when the team of George Dempsey (Aus) and Lew Rush (Can) rolled across the finish line winner. Winner by a fistful of points only, Dempsey and Rush can pride themselves they were the principals in perhaps the most closely contested six-day event ever run in the country. They had but 55 digits, representative of little more than one sprint, over the second place team, Henry 'Cocky' O'Brien and Bobby Echeverria.... Trailing O'Brien and Echeverria on points and with two other teams snapping at the rear tires of their bikes, Dempsey and Rush called all their speed and experience into play to assemble those scant tallies which proved the difference the difference between victory and defeat. (Oakland Tribune, February 10, 1936). After this victory, Lew Rush semi-retired from professional six-day bicycle racing and returned to Victoria B. C. where he took on a job with an oil company. There was talk of going to Japan in 1937 with a troupe of riders to put on a six-day exhibition with promoter Eddie Saunders. No record information was found if that trip took place. Lew did not race the six-day circus in 1937 but in February 1938 he did return to the Bay area to race at the San Francisco Six-day Bicycle Race partnered with his 1932 LA Olympics friend Eddie Testa (Usa). Lew had to abandon because of fatigue and injury. This was Lew Rush's last six-day race. Whether it had been a conscious decision or not Lew Rush had become one of a small group of competent west coast six-day racers who were well received by the sporting public. As was noted by author and six-day racer, Ted Harper in Six Days of Madness (1993) Lew, "was a good-looking, flashy rider...who was one of the smoothest riders in the cycling game." While Lew did race in the major six-day races in the Eastern Canada (Toronto, Montreal) and a smattering of USA eastern cities, his main focus was riding on the west coast. Over his seven years as a professional six day racer Lew rode nine (9) six-day races on the west coast of the continent: Four times in San Francisco, twice each in Los Angeles and Oakland and once in Vancouver. Over his career Lew raced in 23 six-day races making the podium 6 times with two victories (Los Angeles and Oakland) two 2nd place finishes (San Francisco and Oakland) and two 3rd place finishes (both in San Francisco). In 2007 Lew Rush, along with Glen Robbins and Stan Jackson, from the Canadian 1932 cycling team were inducted into the Greater Victoria Sports Hall of Fame.